Since the July 2016 coup attempt, Turkey has seen mass arrests and trials on terrorism charges of thousands of people not involved in any violent act. Among them are journalists, human rights defenders and opposition politicians tried in proceedings which rights groups have documented as politicized and unfair. While lawyers always have a critical role to play in protecting the rights of suspects in police custody and defendants in court, their role in protecting the rule of law and human rights is all the more fundamental in the context of the current crackdown in Turkey. Yet, or more likely because of that, as this report demonstrates, authorities have also targeted lawyers, in particular criminal defense lawyers. The report examines a pattern of prosecutors investigating and opening cases against lawyers. It documents cases in which prosecuting authorities have criminalized lawyers for activities undertaken to discharge their professional duties and have associated them without evidence with the alleged crimes of their clients. Some of these prosecutions appear to have come about in reprisal for their efforts to document police abuse and other human rights violations and to protect the rights of their clients. The report also documents cases where police have threatened and intimidated lawyers, obstructing and interfering in their professional duties. The report concludes that the authorities’ unwarranted and abusive targeting of lawyers for prosecution has undermined a key guarantor of the right to a fair trial in Turkey. The majority of those on trial for terrorist offenses in Turkey at time of writing are charged as members of what the courts and government term the “Fethullahist Terror Organization” (commonly abbreviated to FETÖ) because they accuse the movement, connected with the US-based Muslim cleric Fethullah Gülen, of being responsible for the attempted coup. The second largest group facing terrorism charges are prosecuted as members of the armed Kurdistan Workers’ Party (PKK). A smaller number of people have been charged with terrorism offences for links to smaller outlawed leftist groups and the extremist group Islamic State (IS). In November 2018, Ministry of Justice figures revealed that 17 percent of Turkey’s entire prison population (44,930 individuals out of the total prison population of 260,144) consisted of inmates either convicted of or on trial for terrorism offences and facing sentences typically in the range of seven and a half to twelve and a half years for membership of a terrorist organiturkey0419_webzation to much higher sentences for those facing multiple charges. Tens of thousands more individuals being prosecuted for terrorism offenses are at liberty. In the period since the attempted coup, the authorities have considerably widened the already overly broad and vague definition of terrorism. The majority of lawyers on trial for terrorism are charged with being FETÖ members and a smaller number are on trial for PKK membership or links to outlawed leftist groups. In the case of those prosecuted for PKK membership or links to leftist groups, the prosecution is often based on statements they gave to the media or their participation in press conferences or demonstrations. 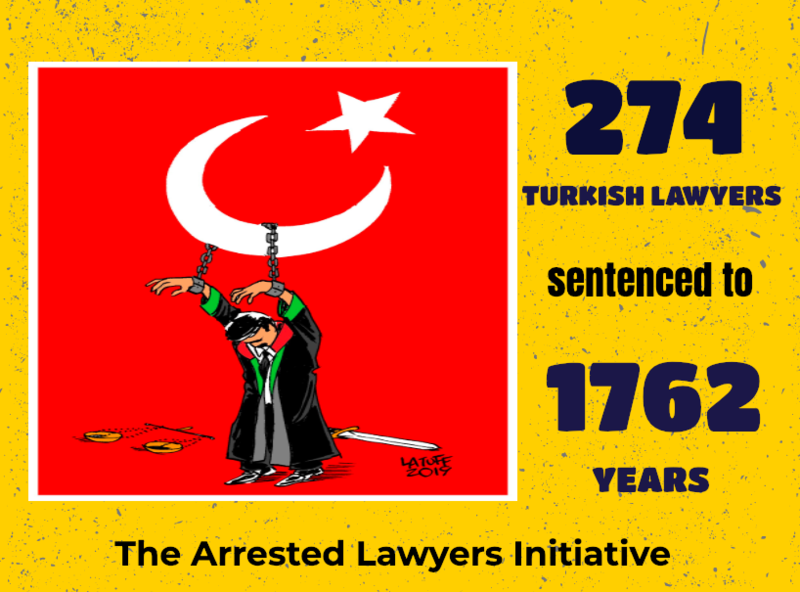 A civic group, the Arrested Lawyers Initiative, reported in April 2019 that 1,546 lawyers have been prosecuted, with 274 among them convicted in first-instance courts of membership of a terrorist organization, and 598 having been held in pretrial detention for varying periods. In the months after the July 15, 2016 attempted coup, detainees accused of being members of FETÖ often had difficulty getting lawyers to represent them, with delays even in getting enough compulsory legal aid lawyers to be present during their interrogation by prosecutors and appearance before courts. Antipathy to the Gülen movement in Turkish society as a whole may account for some of the reluctance of lawyers to step up and be involved in FETÖ cases, but lawyers were also concerned they themselves could be prosecuted for taking on these cases. This report shows that such concerns were justified. The increase in cases of lawyers being threatened and prosecuted has occurred in a context where the Turkish authorities have also imposed rigorous restrictions on the right of individuals in pretrial detention accused of terrorist crimes to benefit from legal counsel and to prepare for defending themselves in court. Several measures introduced under the state of emergency by decree and subsequently made law and incorporated permanently into Turkey’s Criminal Procedure Code (CPC) and Law on the Execution of Sentences and Security Measures undermine the right of a suspect to legal counsel and a defense. For example, prosecutors have the power, routinely invoked, to authorize police, with post facto court approval, to restrict lawyers from meeting with clients during the first 24 hours of their police custody. Lawyers’ privileged communication with their clients in pretrial prison detention has been effectively abolished as authorities are permitted to record and monitor all communications between lawyer and client, and the number of lawyers permitted to represent a client in court in a terrorism case is limited to three. Lawyers can find themselves barred from acting for a client facing a terrorism investigation for up to two years, if they themselves are under investigation for terrorism; and courts can restrict named lawyers from accessing investigation files of individuals in police custody on suspicion of terrorism offenses. Police also regularly use such court decisions to prevent named lawyers from meeting with detainees. Measures that undermine equality of arms and the adversarial elements of trial proceedings inherent to building a defense, also include allowing courts to conduct hearings and issue verdicts without lawyers present if they rule the lawyers have not provided reasons for their absence; to reject lawyers’ requests to hear witnesses if they deem the aim is to prolong the trial; and to hear some protected witnesses remotely, with their voices altered or faces screened, so they cannot be cross-questioned in person in court. Similarly, another provision has led to courts routinely barring defendants in prison from attending their court hearings in person but rather having them join remotely by video linkup to the prison (known in Turkey as Ses ve Görüntü Bilişim Sistemi, SEGBIS). Lawyers interviewed by Human Rights Watch reported that, in terrorism trials, courts have become increasingly unresponsive to their petitions to have evidence critically examined or tested and to hear witnesses for the defense. Lawyers said they were little more than “extras” in court hearings. Equality of arms between the prosecution and the defendant cannot be preserved if the defendant’s lawyer is with no valid justification barred from mounting an effective defense and if the adversarial elements of proceedings become little more than a formality. In addition, under the state of emergency the government closed down many lawyers’ organizations, most notably three which have a strong focus on human rights cases and supporting the rights of defendants in terrorism cases, namely the Contemporary Lawyers Association, the Free Lawyers Association and the Mesopotamian Lawyers Association. Scores of other lawyers’ associations, such as the Ankara-based Law and Life Association (Hukuk ve Hayat Derneği), were closed under first state of emergency decree in July 2016 accused of having Gülenist affiliations. All the lawyers interviewed for this report told Human Rights Watch that the Union of Turkish Bars, the professional body to which all Turkey’s provincial bar associations are affiliated, was reluctant in the post-coup period to offer a robust defense of the principles of the right to a fair trial and the right to legal counsel for all suspects and defendants. Similarly, they argued, bar associations and the Union of Turkish Bars have failed for the most part to employ their institutional strength and authority to uphold the rights of lawyers in a principled and impartial way. They have been unwilling to support lawyers faced with serious obstacles in discharging their professional duties and have often failed to support lawyers subjected to arbitrary investigation and prosecution.